The algae outbreak at the St. Lucie River, June 27, 2016. Florida is in crisis as outbreaks of red and green slime take over the state’s iconic beaches and waterfronts. Whether it’s the red tide on Florida’s southwest coast, or the green slime on rivers, lakes, and other freshwater habitats across the state, these persistent, harmful outbreaks aren’t natural. The outbreaks are caused by excessive amounts of toxic pollution from sewage, fertilizer, and manure. And they’re threatening people’s health and livelihoods, as well as killing off massive amounts of marine life. Here’s a breakdown of the toxic outbreaks, why they’re harmful, and the concrete steps we can take to prevent them in the future. Dead fish near a boat ramp in Bradenton Beach, Fla., on Aug. 6, 2018. From Naples in Southwest Florida, about 135 miles north, beach communities along the Gulf coast have been plagued with red tide. 1. What are these toxic outbreaks? 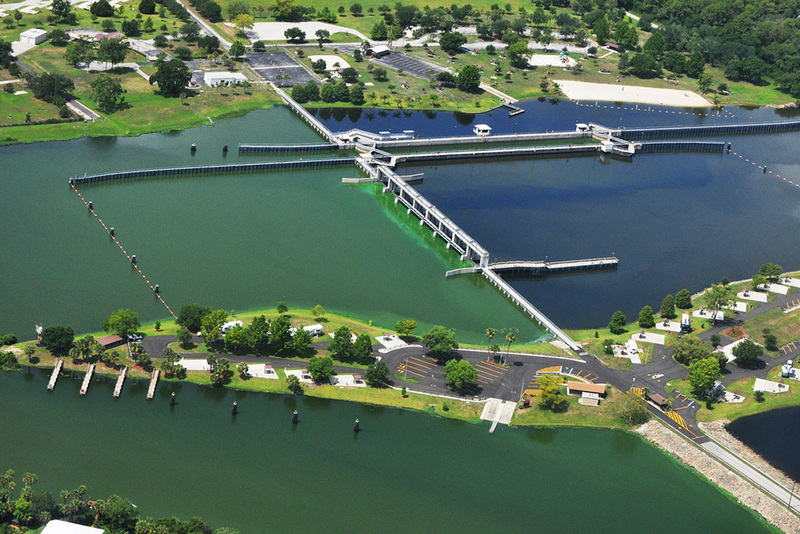 The red tide and green slime coating Florida’s waterways feed off the industrial-scale levels of pollution flowing into Florida’s waterways. Warmer waters and higher carbon dioxide levels from climate change could also be fueling the toxic tides. The red tide that began in October 2017 and is floating off Florida’s southwest coast is an assortment of phytoplankton known as "dinoflagellates” that aren’t actually red close up but appear so in large numbers. One dinoflagellate in particular, Karenia brevis, is especially toxic and can wreak havoc on the body by causing an influx of sodium in those who ingest or inhale it. The blue-green slime that has been smearing freshwater habitats like Florida’s St. Lucie River is actually a bacterium called “cyanobacteria” that emits toxins potentially carcinogenic for humans and animals. Though red tides and green slime outbreaks have occurred in the past, these harmful outbreaks are increasing in frequency, duration, and geographic region. To date, green slime has smothered about 90 percent of Lake Okeechobee, one of the nation’s largest lakes. And in 2016, the bloom was visible from space. At the same time, red tide is impacting approximately 145 miles of Florida coastline. It has been declared the state's longest-lasting algae outbreak in a decade. NASA Earth Observatory image acquired July 2, 2016. 2. What’s causing the algae outbreaks? The presence of some algae in the water column is a natural occurrence. But decades of dumping of fertilizer, sewage, and animal and human waste have added excess levels of phosphorus and nitrogen, feeding the toxic algae to unnatural levels and poisoning Florida's waters. Lake Okeechobee — once the jewel of the State of Florida — has long received massive amounts of agricultural waste from industrial-sized sugar-cane fields, dairies, cattle operations, and croplands from north and south of the lake. Human waste from rapid development north of the lake, as well as population growth, has also added to this pollution. For decades, Earthjustice and others have warned that the industrial dumping in the lake was creating a powder keg situation that is now exploding far beyond the lake, which discharges through the St. Lucie and Caloosahatchee rivers into both the Atlantic and the Gulf. 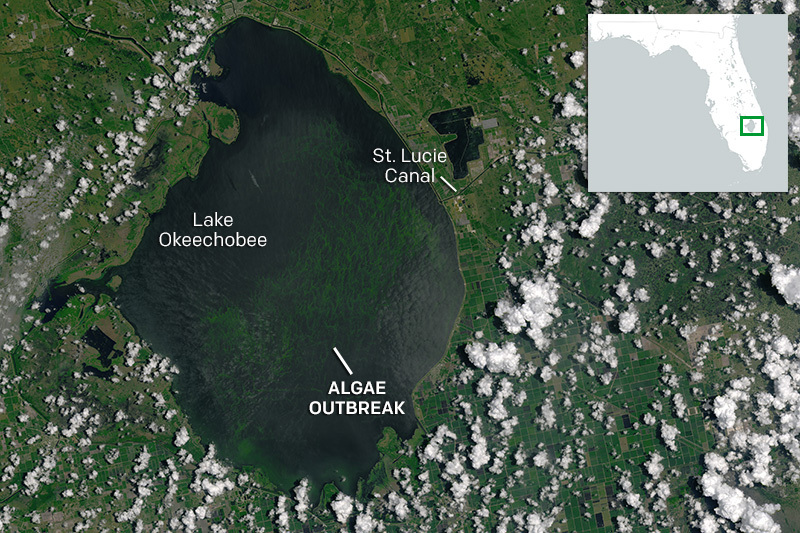 The pollution causing the blue-green algae outbreak in Lake Okeechobee contributes to the coastal red tide. 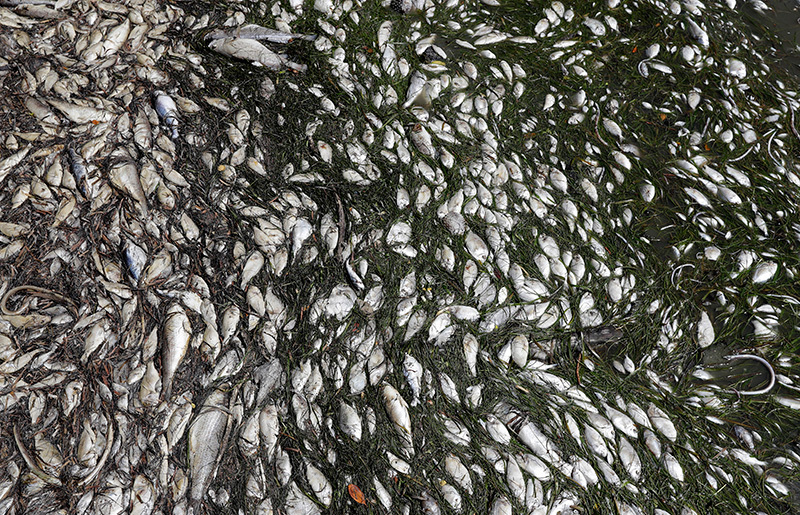 As the blue-green cyanobacteria decays, the released nutrients feed and worsen the red tide. Both outbreaks are also likely fueled further by climate change’s warmer waters, hotter temperatures, and intensifying storm seasons. 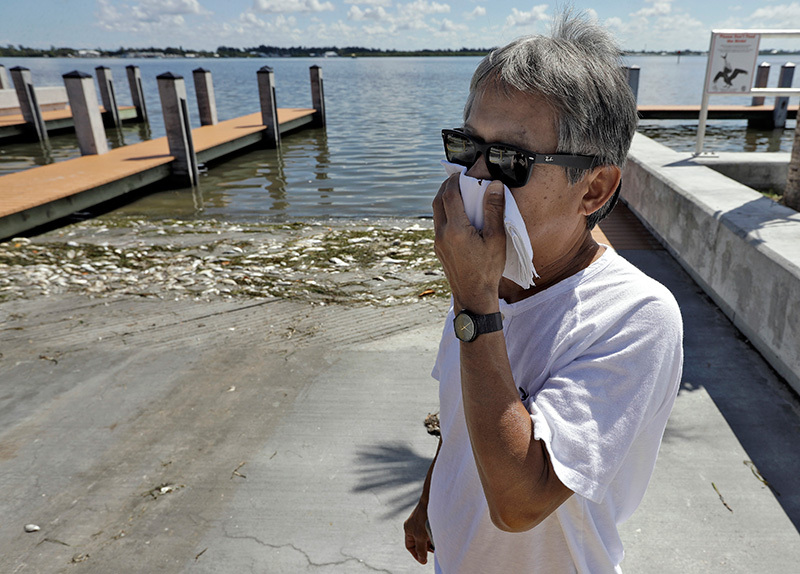 Alex Kuizon covers his face as he stands near dead fish at a boat ramp in Bradenton Beach, Fla., on Aug. 6, 2018. Normally crystal clear water was murky, and the smell of dead fish permeated the air. A Miami-Dade police officer wears a gas mask for protection in Miami Beach, Fla., on Oct. 4, 2018. Many of Florida's beaches were empty because of a red tide outbreak on both the Gulf and Atlantic coasts. 3. What are the health risks of toxic algae? The red tide organism, Karenia brevis or K. brevis, produces toxins that can affect the central nervous system of fish and other vertebrate species who ingest them, causing them to die. Environmental impacts include massive fish kills; marine mammal, sea turtle and sea bird mortalities; and impacts on benthic communities including sea grass and coral community die-offs. In Manatee County alone, for example, “more than 150 tons of dead fish, sharks, dolphins, and manatees have been dragged out of the once-azure waters” as a result of the red tide, reports The Christian Science Monitor. And environmental officials told the Washington Post that the toxic outbreak has also killed hundreds of thousands of fish in the Tampa Bay region, as well as dozens of bottlenose dolphins and even a 26-foot whale shark. Red tide is also dangerous for humans. Eating shellfish contaminated with the K. brevis toxin can cause neurotoxic shellfish poisoning, with symptoms like vomiting and nausea and a variety of neurological difficulties. Regulators ban recreational shellfish gathering during red tide events and commercial shellfish operations strictly monitor for red tide. But people can also be exposed through the air, causing respiratory and eye irritation, particularly in those with severe or chronic respiratory conditions such as emphysema or asthma. 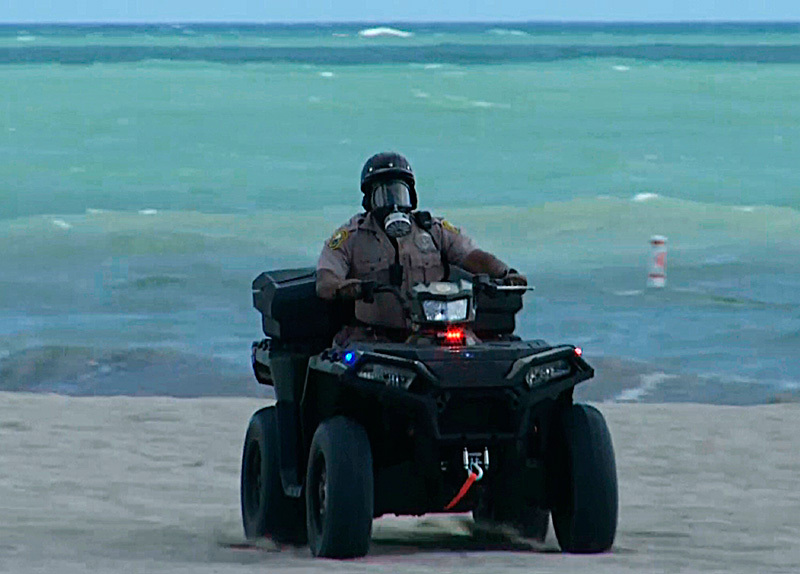 Some lifeguards have even taken to wearing gas masks on Florida’s beaches to limit their exposure. 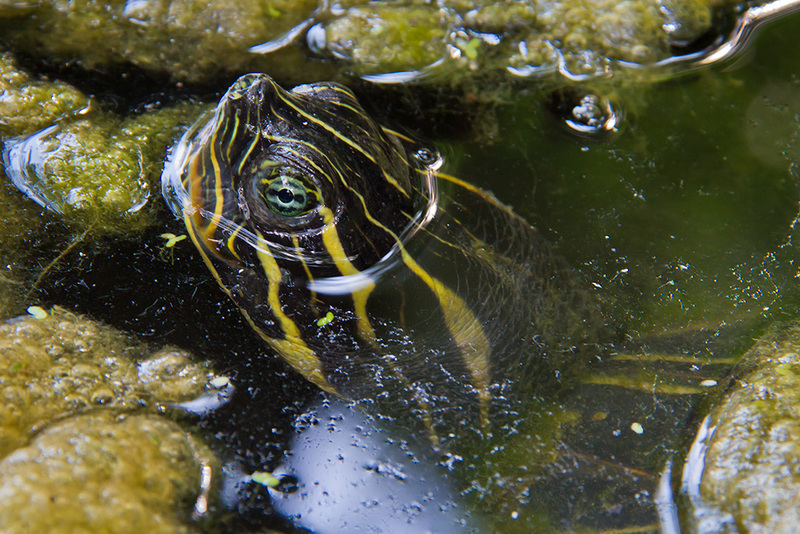 Blue-green slime is also toxic to wildlife and humans. Touching or ingesting water containing this cyanobacteria can cause symptoms such as skin rashes, runny nose, sore throat, allergic reactions, severe gastroenteritis, liver or kidney toxicity, and neurological problems. Over two days in July 2018, a blue-green cyanobacteria outbreak in the St. Lucie River sent 15 people to seek medical help. The head of infectious diseases for the local hospital system expects there were many more who were impacted but didn’t seek treatment. Two months later, blue-green algae also reportedly killed a healthy 9-year-old poodle. And manatees coated in the toxic muck have been seen gasping for air. In addition, the International Agency for Research on Cancer, a specialized division of the World Health Organization, has determined that microcystin, one of four major toxins made by blue-green algae outbreaks, is possibly carcinogenic to humans. Toxic algae fouls the Santa Fe River in May 2012. 4. What’s the state doing about the algae outbreaks? Florida Gov. Rick Scott has recognized the devastation that dirty water is having on Florida tourism, real estate, and fishing by declaring a state of emergency in some counties. But his administration has done little to stop the pollution that’s causing the crisis. In fact, the state and its political leaders have done nothing to stop this pollution for decades, repeatedly refusing to control the pollution by enacting protective legislation or enforcing the few laws that are on the books. 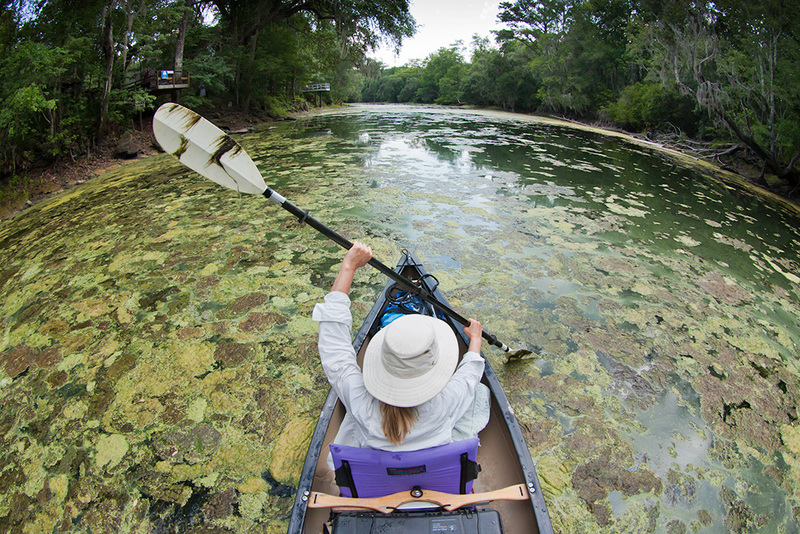 The Scott administration and Florida legislators continue to kick the can down the road, and officials have even gutted water quality monitoring as the algae crisis has worsened. The political inaction is largely due to the stronghold that polluter industries like Big Ag and developers have had over Florida’s politicians for years. Between 1994 and 2016, the sugar industry alone contributed more than $57 million to state and local political campaigns, according to an investigative report by the Miami Herald. That money was well spent, given that for years legislators and regulators have continuously sided with powerful polluters like the sugar and cattle industries. Rather than acknowledge and address the pollution feeding this crisis, political leaders continue to misleadingly claim these are merely “natural” phenomena. Meanwhile, the algae crisis continues to devastate the state’s marine ecologies, cost the tourism and fishing industries billions if not trillions of dollars in lost revenue, and put Floridian’s health and quality of life at risk. 5. How can we prevent these toxic outbreaks? “Calling these outbreaks ‘natural’ is like calling a rat infestation ‘natural,’” says Earthjustice attorney Alisa Coe. Second, we know how the nitrogen and phosphorus in sewage, manure, and fertilizer tip Florida's delicate ecological balance. And we know that climate change is adding pressure to these problems, which makes the need for action all the greater. We have a responsibility to demand action. 6. What is Earthjustice doing? Earthjustice has spent years battling pollution of Florida’s waterways while state and federal officials have fought us at every turn. Government’s failures to address pollution are the main reason we are where we are. We will continue fighting the assault on the truth of what is happening, and to get meaningful regulations to restrict this type of pollution. We are also encouraging Floridians to tell their representatives to support our recent court victory in the Amendment 1 conservation land-buying case and use the money as voters intended, to buy up more public land. Conservation land acts as an important filter to polluted water, and is needed now more than ever to protect our waterways. Earthjustice’s Florida Office was established in 1990. Water rules over much of the state. But water quality has been declining for decades. From locations in Tallahassee and Miami, Earthjustice attorneys in the Florida regional office work to protect the state’s precious waterways from agricultural and sewage runoff. We will restore Florida waters to the astounding natural resource they once were.